In January 2015 Advera Health released a Drug Safety Monitor analysis comparing the safety of then newly-approved Hepatitis C drugs Viekira Pak to Harvoni and Solvaldi (hereafter just Harvoni). Our analysts concluded, "...both Harvoni and Sovaldi appear to be safer options compared to Viekira Pak, but only close post-marketing monitoring will determine the true safety profile of these medications." We went on to write several blog posts asking questions about Express Scripts' and other payers' decisions to exclusively cover Viekira Pak. We also participated in panel discussions hosted by the American Journal of Managed Care (AJMC) and Bloomberg with other healthcare pundits to defend our position. And we received a lot of "fan mail" from Abbvie supporters. Confident in our conclusion that Harvoni was the safer choice, we reiterated our core belief that only with close post-marketing monitoring will the true safety profile of the drugs be ultimately revealed. And close post-marketing monitoring we did. Since January 2015 the Advera Health team has submitted seven separate Freedom of Information Act (FOIA) requests for these three drugs to access virtual real-time data, and over 11,000 case reports in the past nine months, all of which were made available to our clients before FDA publicly released the data on its own. "...Viekira Pak's RxCost (a methodology to determine direct costs of adverse drug events) per prescription increased by 200% to $151.00, and its RxScore (a drug safety scoring system for post-approval drug safety) increased by eight points to 73.93, making it the riskiest option of the three drugs, according to our analysis. In contrast, our analysis points towards Harvoni as the safest option, with a 32% drop in RxCost per prescription ($60.24), and the lowest RxScore (68.98) of the three chronic hepatitis C treatments discussed here." 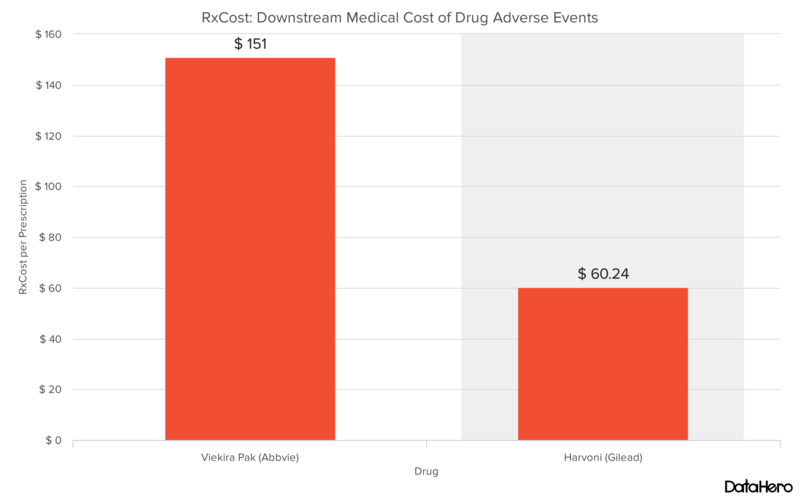 Using RxCost and prescription data obtained by our partner The Evaluate Group we can estimate that if all Viekira Pak patients were instead given Harvoni, the healthcare system would have saved $3.7 million in downstream medical costs that result from Viekira Pak adverse events (AEs). And this is a conservative estimate. According to further research it is estimated that about 1.77% of Harvoni and Viekira Pak serious AEs are unreported. Using this multiplier the savings would top $6.5 million. We expect this expense to continue to grow as time goes on, and as more patients are given Viekira Pak. So were the payers who chose Viekira Pak wrong? These data suggest they were. Did they choose short term financial incentives over long term costs – and more important, patient safety? It seems to be so. Should patients, prescribers, insurers and government agencies care? Without a doubt. Can a positive impact be made both in terms of costs and outcomes be made by reacting to these data? Definitely. It is a given that costs are out of control in healthcare, but what also should be a given is that data are data, and the data reveals the truth in numbers. These numbers say patients with Hepatitis C should be provided with Harvoni over Veikira Pak, if safety is at all a factor. Payers are highly focused on immediate cost containment rather than the longer-view approach that emphasizes outcomes and lowering total costs. And without a doubt we have proven with these data that this approach is a costly mistake.